There's now a catastrophic tsunami warning gutting the Alaska coastline after a 6.6 magnitude earthquake has stunned the capital of downtown Anchorage. Seismograph in Sonora, KY (just south of Elizabethtown) easily picked up the Alaska #earthquake. The National Tsunami Warning Center said a Tsunami Warning is in effect for parts of the state’s Cook Inlet, and the southern Kenai Peninsula, according to CNN. "I could tell this was bigger than anything I'd been in before, and it wasn't going to stop," Alaska resident Philip Peterson said. President Trump has been briefed on the Earthquake and possible Tsunami, with former Vice Presidential candidate Sarah Palin saying that her home is no longer intact. 🙏🏼 for Alaska. Our family is intact - house is not... I imagine that’s the case for many, many others. So thankful to be safe; praying for our state following the earthquake. "[Pray] for Alaska. Our family is intact -- the house is not... I imagine that's the case for many, many others. So thankful to be safe; praying for our state following the earthquake," she said on her verified Twitter account. 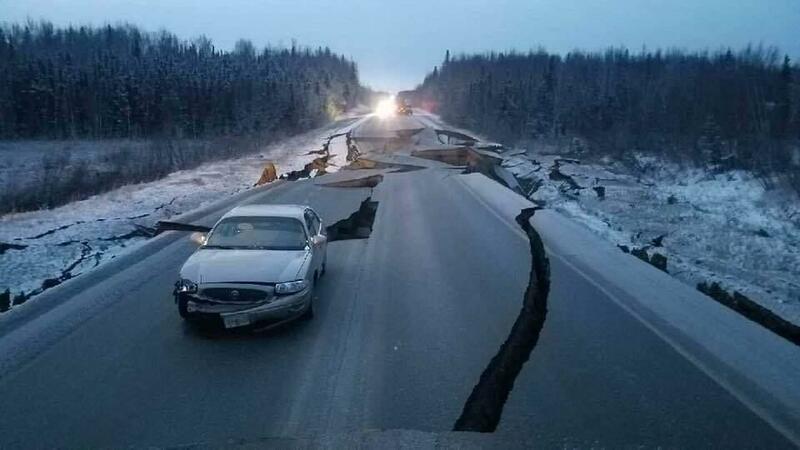 Footage from Anchorage shows devastation with roadways destroyed, as residents of Alaska are in fear of a pending tsunami mid-winter. A tsunami warning is in effect for the coastal areas of Cook Inlet and the southern Kenai Peninsula. Expected arrival times are 9:25 AM in Kodiak, 9:30 AM in Seward and 11:45 AM in Homer. State Of Alaska Division of Homeland Security and Emergency Management's Jeremy Zidek says there is no immediate threat to Anchorage. However, in the event of aftershocks, drop cover and hold on, he said, as aftershocks may be more powerful than the original earthquake. "We must be vigilant in the next few days and months," he stated. "Drop, cover and hold on." We're sending our thoughts and prayers to all affected by the devastating earthquake, and those under threat from the tsunami warning. This is a breaking story that will be updated as time allows for more information.